Small Foot Inflatable Snow Shoes | OhGizmo! By Andrew Liszewski on 01/26/11 • Leave a comment! 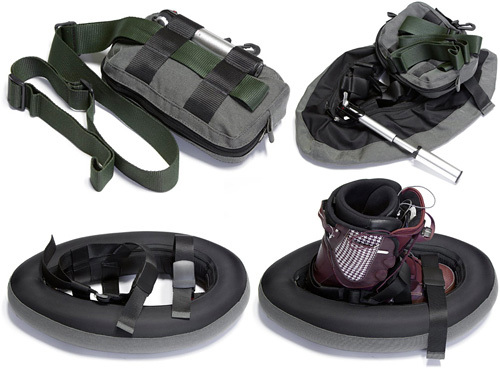 They certainly don’t have enough surface area to permanently replace a full-sized set of snow shoes, but if you’re in the backwoods snowboarding or skiing and are trying to make your away across some deep powder, these Small Foot inflatable snow shoes look like they’re far more convenient to carry when not being worn. When deflated they can easily be stashed inside a set of wearable pocket-like bags, with plenty of room left over for the included compact pump. And once inflated, a set of straps allows the Small Foot to be securely attached to your boots, supposedly providing enough surface area so that you don’t sink to your knees in a deep drift. No pricing or availability info just yet though.